When the winter comes, who will protect you from the monsters? I Highly Recommend this for people who want to read a Russian/Slavic inspired Fantasy novel. I Recommend this for your average Fantasy reader. This book was very nearly a home run. The author includes in this reasonably compact 323 pages excellent characterization and worldbuilding, as well as a strong plot and seamless storytelling. It wasn’t perfect, but by and large it was excellent and a far above average debut. The most vivid part of this book was the setting. 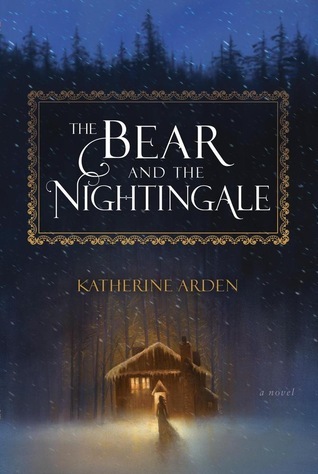 Set in the wilderness of Khan-era Russia, where Christianity is quickly destroying the native animist/pagan religion, ‘The Bear and the Nightingale’ is a fantastic period piece about the intersection of mundane Russian peasant life and the supernatural forces of the forest. About the supernatural: there’s a bloodthirsty Rusalka who lives in the nearby pond, a helpful Domovoi who lives in the the house and helped mend clothing, and more. There are helpful and harmful spirits throughout the setting, each with their own personality and purpose for existence. However they are going extinct as the peasantry stops believing in them. Their extinction allows for the beginning of the plot, as the Bear is released from captivity caused by the spirits which keep him captive slowly dying. The author successfully conveyed a mood of the bleak Russian winter, which added believably to the story. All the primary characters were fully fleshed out and fascinating to read about. In particular I liked Vasilisa and the priest Konstantine. Without going into details, they both seemed to be fully realized people as opposed to tropes and cliches. The story’s pacing never seemed to slow down for me. It was never too fast either; it was in the Goldilocks Zone of being just right. Now for some constructive criticism. The plot was excellent… up until the climax when the main character went into the forest and met up with the Frost Demon, who was sort of her love interest. That section of the plot seemed out of place in the moody period piece. It wasn’t bad, but it just seemed random. The story would have been better without it or if it was much shorter. More, the climatic battle between the forces of good and evil was a little bit trite. I liked it because climax relied on characterization to tell the story, but it was ultimately something I’ve read before. Further, the character who sacrificed himself to save the day did so without foreshadowing. I needed some foreshadowing for that sacrifice because it came out of left field and not in a good way. Overall this is a very good book which I do recommend.